For Dr. Jason Petkevis of Dental Distinction, his job isn’t just about performing dental cleanings, filling cavities and dental implants. His approach to dentistry is building relationships with patients, offering them the highest quality of care that goes above and beyond the typical dental experience. He calls this philosophy, comprehensive dentistry. “Complete care dentists provide high quality care with a relationship-based approach to treating patients, not just treating their teeth,” he says. “There’s much more to health than just teeth. We like to get to know our patients, address their concerns and achieve what they hope to accomplish. ... We make sure patients have optimal function. Not only do they feel good, they look good as well.” Dr. Petkevis offers a full range of general dentistry services, including routine preventative care, cosmetic dentistry, dental implants, basic restorative procedures and treatment for TMJ (temporomandibular joint) disorders. 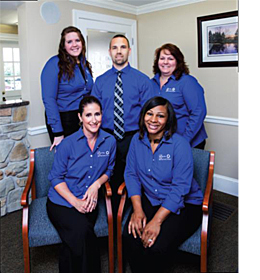 “We’re equipped and trained to handle a variety of different types of dental patients, including those with complex dental problems, patients who have high aesthetic demands, and those who have trouble with their jaw joints or bite,” he explains. “We really excel in those areas.”Dr. Petkevis is one of the few dentists in the area who has received advanced training in treating TMJ disorders—the joint that connects the upper and lower jaw—and is responsible for the opening and closing of the mouth. He says most of the time, TMJ disorders and cosmetic concerns are interconnected. That’s in part because Dr. Petkevis and his staff are constantly taking continuing education courses, learning the newest techniques, and in turn, educating their patients. Dr. Petkevis’s devotion to advancing his practice of dentistry has resulted in being awarded a Fellowship in The Academy of General Dentistry. Dr. Petkevis says he and his staff’s thoroughness and attention to detail with every- thing they do—from routine appointments to complex procedures—sets his practice apart because of their interest in the whole health of the patient. This includes a new- patient exam that addresses 17 key components of oral health. “One of the first things I’ll do during the initial visit is meet with the patient, talk to them for five to ten minutes to get a feel for their concerns, and prepare them for what lies ahead,” he explains. “Once I have listened to the patient and have an understanding of their goals, we begin obtaining relevant clinical information. We take photographs, check blood pressure, perform an oral cancer screening, evaluate the TMJ and bite, check the condition of each tooth, and complete a gum exam. In some cases, we will also obtain bite records and study models. Using this approach, treatments are well-planned. We are basically going through system of checks and balances—if we diagnose a problem, we can present options for a predictable solution. I spend a good deal of time with patients developing a personalized treatment plan. Practicing dentistry this way puts patients at ease. It leads to a more comfortable, longer lasting, and more aesthetically pleasing final result.” And having a state- of-the-art facility helps diagnose problems quicker and more efficiently. Patients visiting Dr. Petkevis for a complete exam can expect to have his undivided attention. The visit lasts approximately 90 minutes with no interruption. Dr. Petkevis goes above and beyond to make sure his schedule allows individual time with each patient. He sees one patient at a time, allowing him to focus entirely on that patient. Recently, Dr. Petkevis worked on a complex case with a patient who had missing front teeth, alignment and bite issues. The transformation from start to finish took about a year, but was well worth it for both Dr. Petkevis and the patient, whose results were life-changing. Transforming patients smiles, giving them that boost of confidence they haven’t had in some time and changing their outlook on life is what’s most satisfying for Dr. Petkevis and his staff.